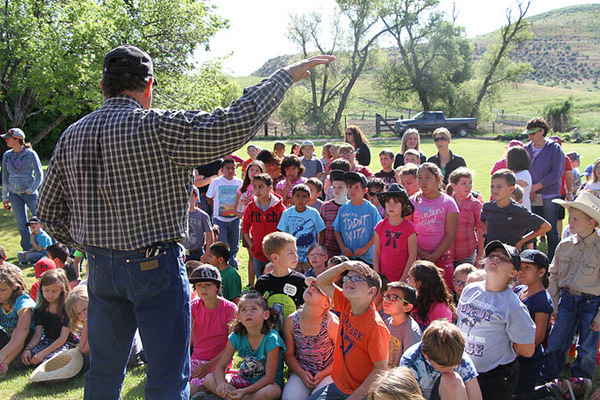 The Idaho Farm Bureau runs a variety of programs that benefit people in all areas of Idaho. The Idaho Farm Bureau Federation works to enhance the lives of its members and realizes no two members are alike. Each of the 36 organized county Farm Bureaus provide programs that work for the betterment of their communities and agricultural livelihoods. Some programs coordinated at the state level are listed below. Scholarships are available to select individuals of Idaho Farm Bureau families for one year of higher education at an institution of their choice. Scholarships are limited to one per recipient. Complete & return the application to your county Farm Bureau office for verification of membership. Contact your county Farm Bureau for deadline dates. 2019 deadline is past. Check back in January 2020 for next years forms. This new program is designed to allow counties a format to share ideas and innovations with other counties. This is a chance for counties to showcase their efforts in many areas. Each county has the opportunity to earn up to $280 on their application. Additional cash awards will be presented at the state annual meeting for the top two ideas/projects in each category. Finally, two awards of $250 will be presented at the state annual meeting to two counties for top innovative ideas found on a County Showcase Awards application in any category. Counties do not need to start an application from scratch. All counties will simply make changes to their previous application that is available from their regional manager. The Young Farmers & Ranchers program is a wonderful blend of training, networking, leadership opportunities, and good old-fashioned fun for Farm Bureau members between the ages of 18-35. People of this age group receive training according to their specific needs and life experience. Topics for conferences and workshops are based on the realities of being a young farmer or rancher today in Idaho. One of the YF&R program's biggest strengths is its ability to provide networking opportunities, where friendships are developed and challenges are discussed. The Women's Leadership Committee works on many fronts to advocate for education, consumer understanding, leadership, information, organization, and policy development. Such programs include Ag in the Classroom, the Women's Scholarship Program, Our Food Link activities, Ag Day, Earth Day, Farm/City Week, and safety and health programs. The Moving Agriculture to the Classroom (MAC) program brings a fun and interactive experience for children to learn more about agriculture in their schools. This program was specifically designed for children in grades 1-5. Lesson modules can easily be transported from the trailer into a school classroom or other buildings. To reserve the MAC trailer, contact the state office (208) 239-4271 or the regional manager in your area. With over 76,000 member families, the Idaho Farm Bureau is able to negotiate discounts and other incentives with many businesses at the local, regional, and nation level. From hotels, ski resorts, and rental cars, to propane, oil changes, and movie tickets, members can pay less on products and services from over 70 business partners. Each member benefit discount is unique. Some simply require the use of a specific Farm Bureau discount code, while others require a member to display their membership card, print a certificate, or pick up discount tickets from their local county Farm Bureau office. Members may use the member benefits website to access quick information on a specific discount of each member benefit. The mission statement of the Idaho Farm Bureau is as follows: The Idaho Farm Bureau is a voluntary grassroots organization dedicated to strengthening agriculture and protecting the rights, values, and property of our member families and their neighbors. In order to carry out this mission, members of the Idaho Farm Bureau are given timely information about laws and regulations being formed and modified at both state and national levels. The legislative section provides user-friendly tools to help members identify their legislators. Contact channels are also included. In addition, members who sign up are sent Action Alerts when constituent action on important legislation is required. The Ag Ambassador program provides five couples, one from each Idaho Farm Bureau district, the opportunity to travel to Washington D.C. March 6-11 to meet with congressional leaders and discuss issues. In February, Ag Ambassadors receive advocacy training to prepare for their visit. Recipients receive scholarship for airfare and lodging. County Farm Bureau's must submit by Nov. 1, 2017.